Something big happened this past Tuesday. The press release went out today. Well, actually it all probably went down in late September, but the AGMs from three different organizations which all happened this past Tuesday, only confirmed hearsay that I first heard on September 26. Because it was not corroborated, I chose to not share it (as I do with most uncorroborated news) until today when the news was finally announced. Briefly the news is that the voting members of the Art Gallery of Calgary; the Museum of Contemporary Art (MOCA) – Calgary; and the Institute of Modern and Contemporary Art (IMCA) all voted to merge and form a new organization under the name Contemporary Calgary. Developments are anticipated to take place between now and the end of the year – only a few weeks away. I could write a book on these three organizations and the interesting dynamics in the visual arts organizations that have existed, formed or had a brief moment in the sun during the past 40 or so years since the earliest organization was formed. I have conducted significant self-funded research over the past two years on this topic and covering the timeframe since 1911 to present day. This research was prompted by my curiosity about the first museum which housed an art exhibition to open in 1912 and the events, organizations and people that happened or were involved since. I thought it would be an appropriate and timely topic to properly research, with intent to publish a fully annotated publication containing original research to celebrate this historical cultural benchmark in conjunction with the 100th anniversary of the Calgary Stampede, the Calgary Public Library and Calgary 2012. This news release only serves to prove that I was correct in its timeliness and significance. It would still be nice to receive funding so that I can finish my research. But I digress. The first of these three organizations formed was the Muttart Art Gallery which later became known as the Art Gallery of Calgary, a name change occurred when they moved to their present location in the early 2000s. The gallery began around 1975 (a significant year in the City of Calgary) and was housed in the Memorial Park Library for around 25 years. It has suffered because of some unfortunate news relating to a former director that is currently serving time in jail. However, the staff have been very hard-working, provide good programming and have tried to rise above the controversy. I believe they have done very well under the circumstances. The Calgary Contemporary Arts Society was formed and took over the prow of City Hall shortly after the 1988 Calgary Winter Olympics had ended where they occupied a space vacated by Olympics volunteers. CCAS was more commonly known as the Triangle Gallery of Visual Arts, until their name change about two years ago when it became known as the Museum of Contemporary Art (MOCA) – Calgary. They have done amazing things with very little money and staff. For the most part they have had new programing almost every single month with only two or three staff during that whole time. As a former gallerist – just that alone is an amazing achievement. 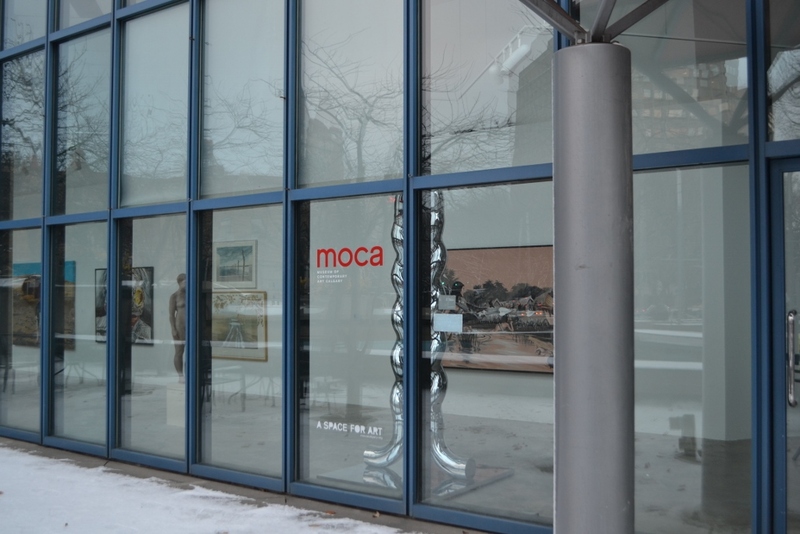 The last organization the Institute of Modern and Contemporary Art (IMCA) has only had a few exhibitions in its existence since it was formed around 1992. These few exhibits if memory serves me correct happened shortly after the turn of the millennium, usually around the ArtWeek/ArtWalk weekends in mid- to late-September. Regardless of this shallow exhibition history, the organization itself has always had grand ambitions, well-connected patrons and connections. They unfortunately were never able to realize their ambition to create a stand-alone arts facility on their own. This is not the first time where some of these organizations have tried to merge and create a more dynamic presence to facilitate a dedicated arts facility for the city. It is interesting to see that former Calgary Arts Development Authority President and CEO – Terry Rock, who stepped down this past June, has been named the Interim Managing Director of the newly formed Contemporary Calgary. Watch for more news in the next short while about the old Science Centre/Planetarium. This past May there was a call for Expressions of Interest by heritage and cultural groups for this facility. It is my understanding that the three organizations submitted a cooperative bid for the planetarium. Unfortunately the flood happened this past June and Alpha House which houses homeless people and those dealing with addictions was flooded. Since the Planetarium was vacant, it was used for that purpose since. I believe that Alpha House has been fully remediated since the flood and as far as I know has received clearance and is able to be occupied as a residence now. The park surrounding the Planetarium would make a beautiful sculpture garden. If this joint proposal from Contemporary Calgary is successful for this space, it would be interesting to see if that also happens. I extend my best wishes to Terry Rock and all those involved in seeing this project move forward. This entry was posted in Art Gallery of Calgary, Calgary Arts Development, Calgary Public Library, Contemporary Calgary, Institute of Modern and Contemporary Art, Museum of Contemporary Art, Progress. The newsletters I received from 2 of the 3 institutions involved were so hard to even start reading, I just deleted them. Thank you for to clear concise writing. Despite the efforts of marketers to attract new customers, the management of service companies also engage in alternative non-communication tactics when building their customer bases.